HMAS Warramunga (II) is the third of eight Anzac class frigates built by Tenix Defence Systems at Williamstown, Victoria for the Royal Australian Navy. The design is based on the German Meko 200 frigate. Warramunga is a long-range frigate capable of air defence, surface and undersea warfare, surveillance, reconnaissance and interdiction. Warramunga's combat capabilities have been significantly improved under the Anti-Ship Missile Defence upgrade program, a world class program that provides an enhanced sensor and weapons systems capability. The upgrade showcases Australian design and integration capability, with new Phased Array Radar technology designed by CEA Technologies in Canberra, upgrades to combat systems performed by Saab Systems in South Australia, and platform integration design by BAE Systems in Victoria. 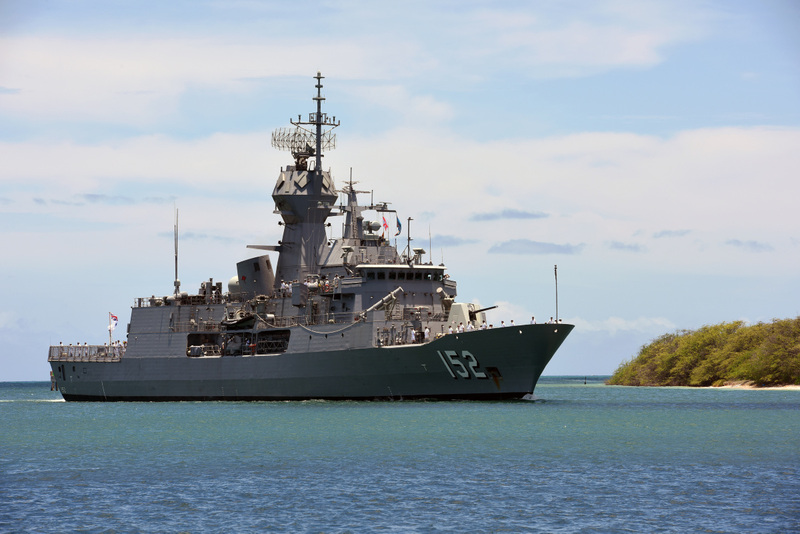 HMAS Warramunga arrives at Joint Base Pearl Harbor-Hickam for RIMPAC 2016. 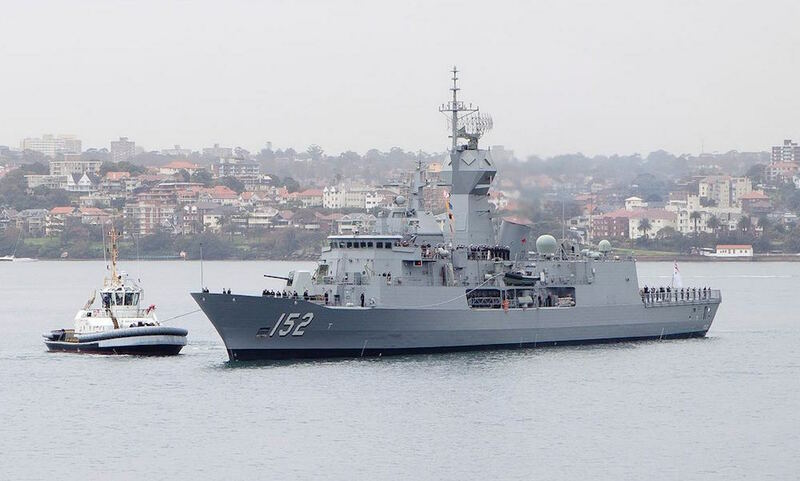 Warramunga is fitted with an advanced package of air and surface surveillance radars; omni-directional hull mounted sonar and electronic support systems that interface with the state-of-the-art 9LV453 Mk3E combat data system. The ship can counter simultaneous threats from aircraft, surface vessels and submarines. The ship's main armament comprises one Mark 45 capable of firing 20 rounds per minute, ship launched Mark 46 torpedoes and a Mark 41 vertical launch system for the Evolved Sea Sparrow missile. Warramunga also has eight anti-ship/land attach canister launched harpoon missiles and a vertical launch system for the Evolved Sea Sparrow Missile. The ship's other defence systems include the Nulka active missile decoy system, offboard chaff and a torpedo countermeasures system. 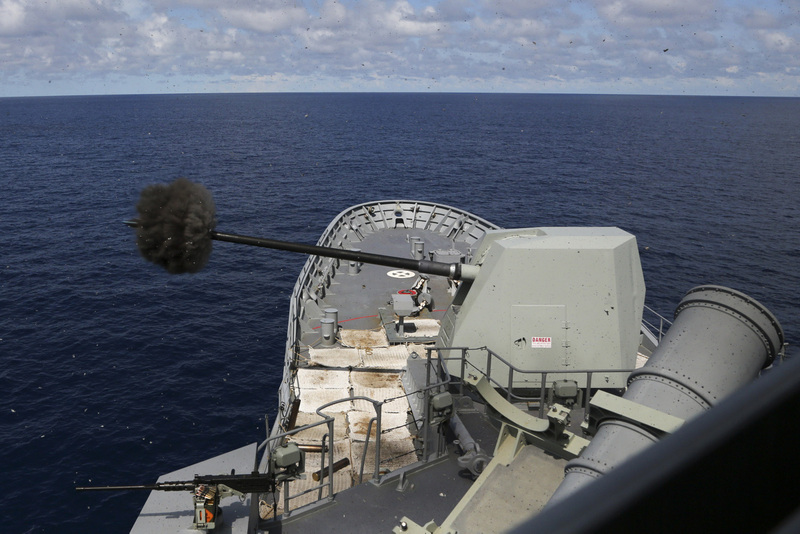 HMAS Warramunga fires their Mk 45 5-inch gun the Northern Australian Exercise Area during Exercise KAKADU 2016. HMAS Warramunga, like her sister frigates HMA Ships Anzac, Arunta, Ballarat, Parramatta, Stuart and Toowoomba features a "combined diesel or gas" (CODOG) propulsion plant which enables the ship to sustain sprint speeds of greater than 27 knots and allows an operational range in excess of 6,000 nautical miles at 18 knots. 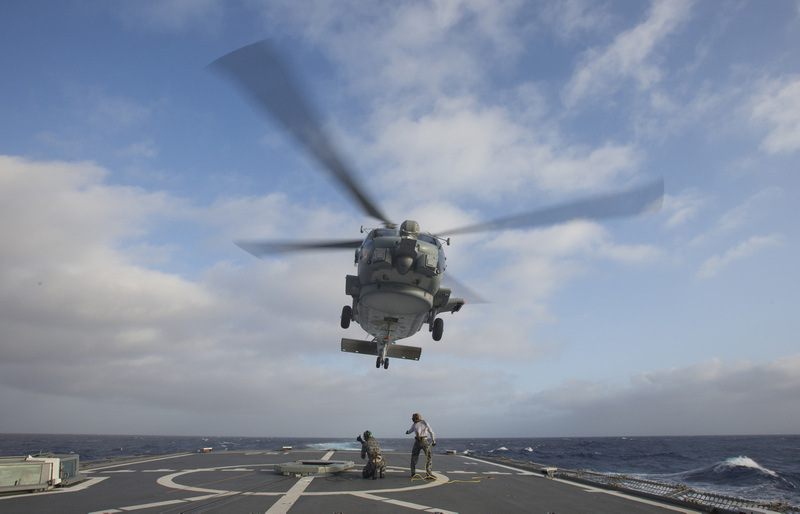 ABATV Michael Pearse (left) and ABATA Benjamin Clark conduct a RAST recovery assist with HMAS Warramunga’s embarked MH-60R helicopter during the ships deployment to Operation MANITOU. HMAS Warramunga is the second ship to bear the same name in the Royal Australian Navy. HMAS Warramunga (I) was the second of three Australian built Tribal class destroyers. She served with distinction in WW II with the US 7th Fleet in the Pacific, the Korean campaign, the Malayan Insurgency and with the United Nations Forces in Korea . The following battle honours have been awarded to Warramunga (I) : Pacific 1943-1945, New Guinea 1943-1944, Leyte Gulf 1944 ( Philippines ), Lingayen Gulf 1945 ( Philippines ) and Korea 1950-1952. The Warramunga name is derived from the Warramunga (also spelt Warumungu) Aboriginal people from the Tennant Creek area and the ship's badge depicts a fearsome Warumungu tribesman about to throw a boomerang. The blue and yellow background represents the sky and a desert hillside. The motto "Courage in Difficulties" honours the Warumungu tribe's life of courage in their harsh environment as well as the Second World War Tribal Class Destroyer, HMAS Warramunga (I). 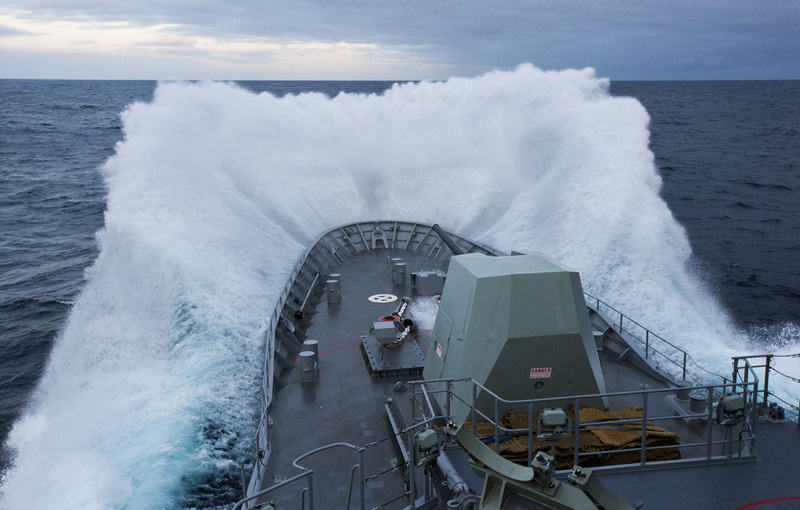 HMAS Warramunga breaks through the ocean waves whilst transiting to Fleet Base West.